One sunny morning in New York, a dozen biologists and volunteers stand in knee-deep water, chucking net sacks of oyster shells down a human chain, before planting them in containers on the riverbed. Why? To build an oyster reef. The goal? To restore a billion oysters by 2035 to America's largest city -- not as a delicacy for the dinner table but in an environmental bid to clean up its notoriously filthy harbor water and generate greater biodiversity. Dressed in waders, the group battles under the hot morning sun on the Brooklyn shoreline, the Statue of Liberty and iconic skyscrapers of New York's Financial District rising up on the horizon. The net sacks contain empty oyster shells, or ones that have been assiduously cleaned or "cured" -- then inserted with oyster larvae -- and placed into containers planted on the seabed that will form a reef. "This was the Big Oyster before it was the Big Apple," jokes Mike McCann, an urban marine ecologist with the non-profit group The Nature Conservancy. "That's a history that has been forgotten by a lot of New Yorkers and this project brings it back," explains the 32-year-old. When English explorer Henry Hudson sailed into New York harbor in 1609, he had to navigate 89,000 hectares of oyster reefs that fed Lenape Indians for generations, writes Mark Kurlansky in his 2006 book The Big Oyster. The Dutch colonialists who followed knew today's Ellis Island and Liberty Island as the Island of the Little Oyster and the Island of the Great Oyster. "Oysters are ecosystem engineers and they build (a) three-dimensional reef habitat," explains Katie Mosher, restoration manager of the Billion Oyster Project (BOP), which was set up in 2014. Oysters also filter and clean the water when they breathe, making it clearer. This enables light to penetrate more easily to the bottom and allows more plants to grow on the seabed. The molluscs also recycle nutrients and nitrogen, and can even mitigate the energy of large waves, reducing flooding and preventing erosion during storms or hurricanes. But New York's original oyster population was almost extinct by the dawn of the 20th century, a victim of overfishing, industrial age pollution and sewage. The waters of New York became too toxic to cultivate much marine life until the Clean Water Act of 1972 prohibited the dumping of untreated wastewater and garbage. Since then, life has slowly returned. "I had no idea there were oysters in New York City!" exclaims Emma Latham, 22, one of the volunteers and recent ecology graduate from Princeton University. "I think it's just great that we are able to take any small piece of land and make it do more, because there's such a dire environmental impact by having so many people in such a small space with so much concrete." 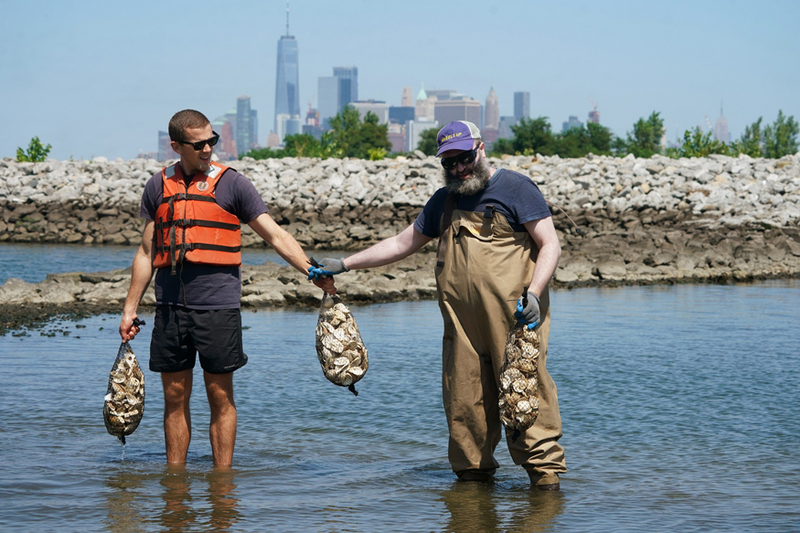 The BOP works with dozens of partners, schools and hundreds of volunteers to build oyster reefs throughout the five boroughs of New York, and is already reaping the first rewards. In just four years, they have already created 28 million oysters, estimating that the harbor waters have never been better in 150 years. "We definitely noticed an improvement when we put oysters down on the bottom," said Mosher. "There's more fish, more crabs. And it happens right away." The reefs have also fueled a growth in wild oysters. Every so often a whopper is found, such as one measuring 20 cm (8 in) in August -- the largest known oyster in the city in a century -- on Pier 40, in the Hudson River at Greenwich Village. In some areas, oyster larvae are so plentiful that all that's needed is to offer them something to which they can cling and survive, explains Mosher. Over the next three years, the organization will return again and again to the same Brooklyn reef to study the oysters and their impact on biodiversity. "We are interested in just the basics. Are these oysters growing? Are they surviving? Are they reproducing and creating a sustainable population?" says McCann. They will also study the quality of the water, how many nutrients it offers, if there are predators or diseases, and if biodiversity has widened. Students do some of the analysis, learning about oysters in class, taking measurements in the field and uploading the data, allowing them to compare what happens in the Harlem River with the Bronx River, for example, and understand why oysters may behave differently depending on the precise habitat. America's financial and entertainment capital chows down an average of half a million oysters a week. Since 2014, the BOP has recycled 450,000 kilos of shells to create reefs. They have also explored alternative assets, most famously the porcelain from 5,000 public school toilets crushed up and used to build reefs with 50,000 oysters in Queens two years ago. But the BOP oysters won't be making their way to a dinner table anytime soon. They are inedible. When it rains heavily in the city, the sewage system can still overflow and contaminate them. Could that change one day? "Probably not in our lifetime," admits Mosher. "The work of the oysters is improve the habitat and improve the health of the harbor."